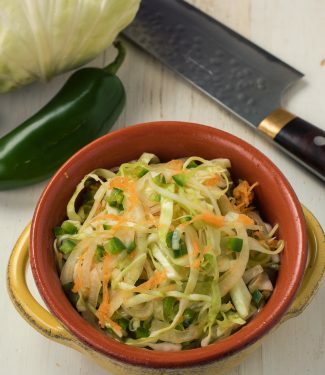 Cabbage, onions, carrots, jalapeños and a slightly sweet and tangy dressing come together in no time flat. With tacos. With grilled meats. Or even a spicy rare tuna steak. It’s also a great way to work on your knife skills. Don’t have knife skills? Today is a good day to start. Get yourself a nice sharp chef’s knife. Google the pinch grip. Watch a couple videos. It’s a life skill everyone needs. It’s not hard. It just takes practice – and this is a great dish to do just that. Nice thing about quick Mexican slaw is it’s not one of those cloying, creamy coleslaw recipes. This isn’t Colonel Sanders electric green special. It’s all about the balance between sugar and cider vinegar. A bit of oil and salt to round it out and you’re done. Ever wonder why some slaws just come together? The cabbage tender? The flavours combined? Just perfect? Simple trick. Pour hot dressing over cool vegetables. The hot dressing softens the cabbage. 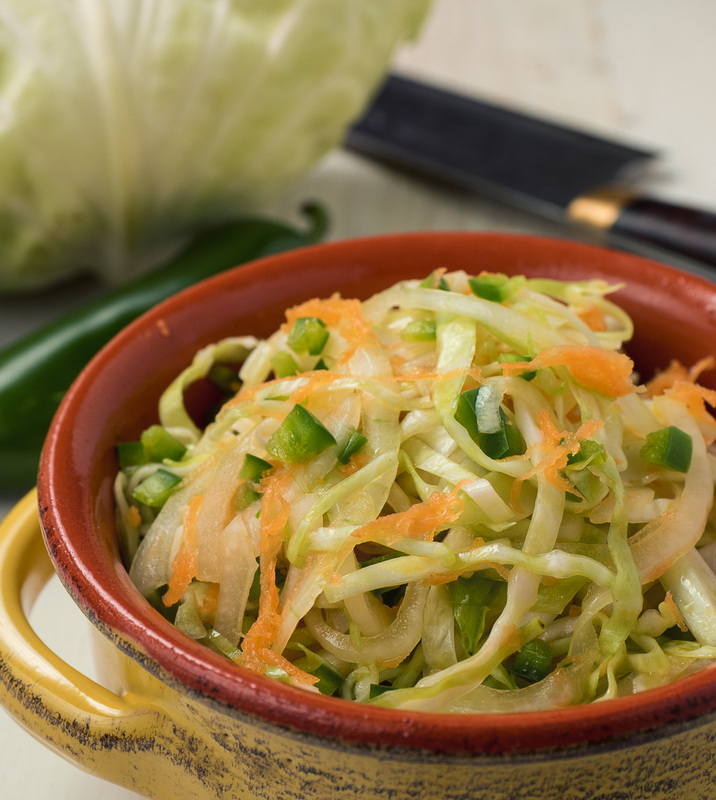 You go from a brutal jaw workout to – well, to great slaw. This always works. Any tangy, oil based slaw is just better. Quick Mexican slaw. Perfect your knife skills. Wow your friends. What’s better than that? 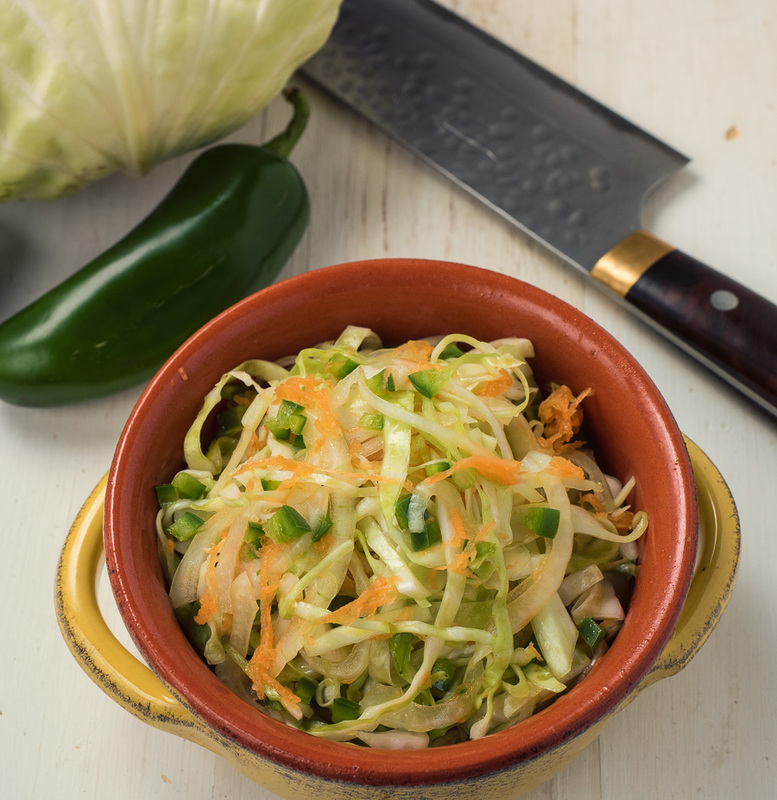 This is an easy, quick Mexican slaw that goes really well with almost any type of taco or grilled meat or poultry. Combine all the dressing ingredients in a small saucepan and bring to a boil. Pour hot dressing over the vegetable mixture and toss thoroughly. Refrigerate about 1 hour to let all the flavours combine. In mexican, salad, sides and stuff. Bookmark the permalink.